DIVING TRAINING FOR PEOPLE WITH SPECIAL NEEDS in Dubai. 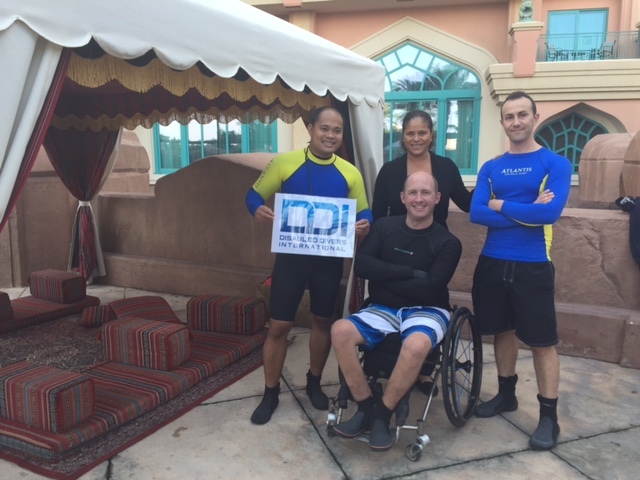 Dubai, United Arab Emirates, 30 March 2016 – Dive Atlantis, the newest addition to Atlantis, The Palm’s resort attractions, hosted a two-day diving training program for people with special needs, as part of its efforts to make diving more accessible and to support social inclusion and social empowerment of people with disabilities. Atlantis Dubai, scuba diving for disabled students. The training, organised in collaboration with Disabled Divers International (DDI), a non-profit organisation, was designed to promote, develop and conduct scuba diving training programs for the disabled in professional and non-professional categories. In addition to the support of the Dive Atlantis team, the sessions were supervised by Mark Slingo, Director of Training and Marketing in DDI, a scuba diving instructor who is currently in a wheelchair due to an accident. Mark conducted the training on the 11th and 12th of March at Dive Atlantis with six professional diving instructors with an aim for them to become DDI certified while learning adaptive teaching techniques required to teach scuba diving to disabled students. Atlantis Dubai, scuba diving training programs for the disabled in professional and non-professional categories. On the first day of training, Slingo covered the theory portion followed by a practical test the following morning. The course was aimed at mobilising individuals with disabilities to enjoy the treasures of the ocean. The initiative comes as part of Atlantis’ Corporate Social Responsibility (CSR), and to increase its entertainment offering to families across the world, whatever their needs or requirements may be. “Diving can be an enriching experience, potentially helping to improve quality of life,” says Mike Ceci, Manager, Dive Atlantis, Atlantis, The Palm. “Dive Atlantis is going the extra mile in providing these educational and entertainment activity to all visitors. Diving is a sport where you experience the feeling of absolute weightlessness, and so diving is usually a ‘comfortable sport’ for those with challenges in regards to movement. Since its introduction in 2010, DDI, which has earned extensive support and recognition within the diving industry, has conducted professional and non-professional programs around the world. All board members are volunteers, dedicated to promoting and developing scuba diving for the disabled internationally. Dive Atlantis provides easy access and participation for all. In addition, all courses can be structured to fit around the holiday plans of both resort guests and day visitors. Guests also get the unique opportunity to learn how to dive in one of the resort’s private and pristine salt water pools, allowing them to become accustomed to the sensation of diving prior to doing open water dives in the sea. Guests can enjoy a variety of accredited PADI courses from the basic Discover Scuba Diving programme to the Open Water Diver qualification, to the more advanced Assistant Instructor courses for those wanting to pursue a career in diving. Certified PADI divers can enjoy an exhilarating half-day trip in the Arabian Gulf aboard one of two luxurious 37 ft Seamaster powerboats. Qualified divers can also choose to broaden their dive experiences with advanced and specialty diving courses, including deep diving, night diving, wreck diving, underwater photography and much more. For further information about Atlantis please call +971 4 426 1000, or visit atlantisthepalm.com. Both low and high resolution colour photography of Atlantis is available at news.atlantisthepalm.com. If you are new user to this site, please complete the online registration to be granted access to the online newsroom. Atlantis, The Palm is the first entertainment resort destination in the region and located at the centre of the crescent of The Palm in Dubai. Opened in September 2008, the unique ocean-themed resort features a variety of marine and entertainment attractions, as well as 17 hectares of waterscape amusement at Aquaventure Waterpark, all within a 46 hectare site. It is home to one of the largest open-air marine habitats in the world, with over 65,000 marine animals in lagoons and displays including The Lost Chambers Aquarium, a maze of underwater corridors and passageways providing a journey through ancient Atlantis. Aquaventure features 18 million litres of fresh water used to power thrilling waterslides, a 2.3 kilometre river ride with tidal waves and pools, water rapids and white water chargers. Dolphin Bay, the unparalleled dolphin conservation and education habitat, and Sea Lion Point were created to provide guests a once in a lifetime opportunity to learn more about one of nature’s most friendly mammals. Atlantis, The Palm is also known as the culinary destination in the region with a collection of world-renowned restaurants including Bread Street Kitchen & Bar, Nobu and Ronda Locatelli. The resort boasts an impressive collection of luxury boutiques and shops as well as extensive meeting and convention facilities.